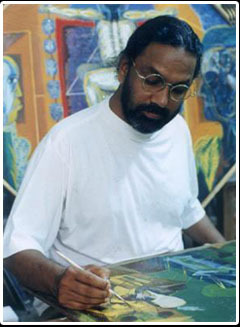 His work is of great interest because he has discovered a very personal way to express something quintessentially Indian at the same time that he expresses something modern. Like Mother India, herself, Hanuman Kambli has one foot in history and another in the future. From Rabindranath Tagore, we hear this "Therefore when we talk of such a fact as Indian Art, it indicates some truth based upon the Indian tradition and temperament. At the same time we must know that there is no such thing as absolute caste restriction in human cultures; they ever have the power to combine and produce new variations ..... proving the deep unity of human psychology". Kambli's artwork can rightly be called narrative. 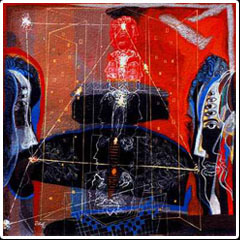 The narratives contain elements of traditional imagery from both religious sources and Art sources about religion, but it also presents themes and ideas that are taken from his immediate environment. In his prints, one can see his family, his home, the land of his ancestors and the Indian Gods, along with the encroaching builders and `developers' who are transforming the sacred land into a global shopping center. He examines the contemporary tension between nature and culture, and the constant contradictions of perception an reality.The Multiple-headed Trimurti appears often in his work, usually two faces in profile, one oriented towards the left and the other towards the right. There is also another face on the frontal plane flattened so that the head is read more as a shape than as a volume. On the frontal-facing head, there is a vertical area which might be read as a nose, hair, stitches, tikka marks, or perhaps just a line separating each side from the other. There is the tikka marks, or perhaps just a line separating each side from the other. There is the concept of unity in diversity here and a reference to Soaham, but it is also a reference to concept of unity in diversity here and a reference to Soaham, but it is also a reference to "being of two minds on an issue" or of having a past as well as a future. A person steeped in the Western tradition might see the Greek God Janus in these images or perhaps, the art of Pablo Picasso. But, it is an Indian cultural reference also and Kambli is well aware of both sets of meanings and references. He often speaks of the individual who is reflected in the universal and the universal embodied in the individual.